Oh. My. Gosh. Ya'll. This book. There are really two parts to genealogy research to me. One is the facts. When they were born, when they died, where they lived, who their people were, etc. The other is their story... how did those facts line up to create a life and what was that life like? How did the surrounding story of the area blend with their individual story to create a narrative of their lives? It is often really, really tough to pull a story out of the facts. John Turner and his wife Patience are one of those that are tougher than others. John Turner was a person of color, and further, he was a former slave so there are virtually no records of his existence prior to his sale to his wife. Post sale, there are land records. He was a slave - and then he was a landowner, in the space of a few years. Squaring that with what I know of history creates this absolutely fascinating tale of how a family of color lived in the contradictory antebellum south. 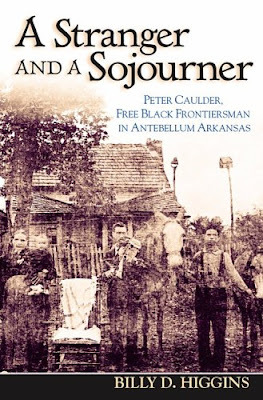 A Stranger and a Sojourner: Peter Caulder, Free Black Frontiersman in Antebellum Arkansas by Billy D. Higgins takes the facts that can be found about the Turners, the Caulders and other families of color in the area, combines them with historical fact and weaves a narrative about their lives, following the sons of Moses Caulder and John Turner into military service together and their lives beyond. Although the focus of the book is on the Caulders and Arkansas, the book really carries them all over the United States and the Caulder's story is only clearly seen sometimes when combined with the details provided by the lives of the Turner family. The author even delves into Powers et al vs McEachern et al, the SC Supreme Court case involving the descendants of John and Patience, along with some of the backstory that I'd completely missed. There is definitely much to read about the Turners in this book, as well! The author highlighted historical records I hadn't thought to look at to paint the complete picture - Like the Mills' Atlas of Darlington District, South Carolina map of 1825. For the first time, I saw on a map of South Carolina where John and Patience lived and who their neighbors were. This book is the holy grail for a genealogy researcher - or at least for me. I always hope I'll stumble into a very well written, illustrated, perfectly sourced account of my family members and it has never happened, ever. Until now. Everything in the book is carefully sourced, with almost half of the book being a bibliography, charts, maps and diagrams. Although I characterize this as a BSO (Bright Shiny Object that must. be. ignored. until. I. get. there., in genealogy do-over terms) for now, it's definitely on my list to dig through those sources and see what else I can extract for my own research - and I might, just might, still pick it up from time to time and poke through the end material. You know - just looking! Billy Higgins paints a picture of their lives with such exquisite detail that I, for the first time, could get a taste of what the lives of the Caulders and Turners were really like and how they really interacted with the white community around them. This is absolutely a must-have account for anyone descended from these families and many, many thanks to Billy Higgins for doing this work. PS : This book came out in 2005, after I'd already done my initial research of John and Patience Turner. It was because of the genealogy do-over that I found it. Do-Over, ftw! When I read it, I also felt a little like the old-timer that had to hike to the conclusions uphill. In the snow. Both ways. Barefoot.